As mothers, we love our children and want to give them everything that is good for them. One of the best ways to show your love is through quality time and intentional care. 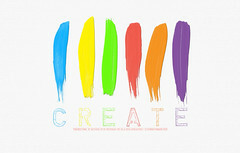 Helping to nurture and develop your child's creativity is a great way to give them the world. With a creative imagination, the sky truly is the limit. If you'd like to find ways to create space for your child's ability to create and imagine, consider these three ideas. Create a workspace/playroom. Whether you live in a large mansion or a small condo or apartment, you can make this happen. Designate a space where your child can play and get work done. Set up stations that show the different colors, numbers, and words your child needs to learn. Install a few hanging shelves to store your child's favorite books. It's important to make sure that this space is in a different room from their sleeping area. When they're able to detach themselves from work and play to fall asleep in a separate room, this helps their minds understand the difference. Plus, studies suggest that this method can help them fall asleep faster when they're able to unwind in a room that they know is designated for rest. Pay attention to their interests. If your child tends to talk a lot about trucks, it might be nice to find a few books in the library that are all about trucks. If your child loves to dance and listen to music, get creative with the artwork in their room. 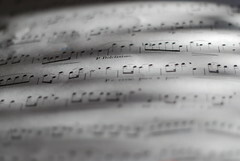 Purchase some sheet music from a sheet music store boston and frame a few pieces to spark more conversations around music. And be willing to turn up the music and dance with your child! Increase exposure to new things. Work on exposing your child to new experiences to boost their creativity. Plan trips to different states and countries. Instead of staying inside all weekend, take trips to the kids' museums, pumpkin patches, and children's theaters. Take them out to enjoy different cuisines from various cultures. Teach them how to make foods from other cultures. Make dishes like sushi, empanadas, and ravioli from scratch. As your child gets to enjoy different experiences, they'll be able to think with a broader worldview and increase their creativity. I don't know about you, but I've always loved Garth Brooks. That's why I was particularly upset that he came here to Indianapolis last fall - when we were out of town. Talk about bad timing! So, it's not exactly the same, but listening to this album - 26 tracks of LIVE music - is as close as I'm getting to that Garth Brooks concert I missed. Even better? You can grab it for FREE right now. 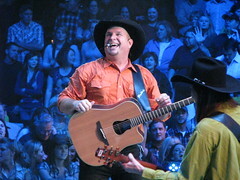 That's right - FREE music from Garth Brooks! You may be one of those people who send flowers for every occasion. While flowers are nice, they're certainly not original. 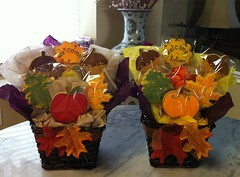 Cookie bouquets are gaining popularity because they’re new and different. There are quite a few reasons why you can give them as gifts. They’re Ideal for All Occasions - Cookie bouquets are appropriate for any occasion. Most people will take advantage of any excuse to eat cookies, and getting them in bouquet form is extra fun. If you were thinking of sending flowers or balloons for one reason or another, decorated cookies can take their place. You may want to send them for a birthday, an anniversary, or even to tell someone to get well quickly. They Are Completely Consumable - You don’t want your gift to someone to die after a few days. (the reason I don't really like getting flowers) Further, for the people who “have it all,” they don’t want another vase or photo frame hanging around the house. Cookies are eaten almost immediately upon being received and can even be shared. People will love being able to eat their gift so that nothing has to get thrown away. Ultimately, you want to give people a gift that they’ll love. Whether it’s a gift for a family member who is sick, a birthday present for a teacher, or a “thanks” to your child, cookie bouquets are original. This is not me explaining PageRank. I still don't really get it. I'd never even heard of PageRank before I started writing some paid blog posts several years ago. Then I learned that it was something to be desired, and the more active my blog was and the more other blogs I could get to link to my blog, the higher my PageRank went. Except that Google doesn't like paid posts and paid links, so they can randomly take away any PageRank a blogger may have earned - which then means none of the advertisers who were willing to pay for posts and links are at all interested in paying for new ones. In fact, they're all asking to have those same links removed ASAP because Google has also penalized their sites. Except, of course there's no payment for removing said links, except in rare cases. Somehow I just have to find the time to remove multiple links, all of them really important. Anyway, the reason I was thinking of this is that I just renewed this domain. I was thinking about just dropping it because I don't use it as often as I thought I might, but then I ran this PageRank Checker and found out this page as a PageRank of 2. Considering I rarely update this blog and don't really do anything with it, that's quite surprising. On the other hand, my recipe blog bcmom's kitchen has a PageRank of 0. Zero. I may not update it as often as I should, but I really do use that blog, and I know there are other blogs linking to it. And I've never done paid posts there. So what's up with that? Yeah, makes no sense to me. So, I renewed this domain - whether I really need it or not. At least one of my blogs has a PageRank of some kind, even though it really doesn't seem to matter unless I'm going to sell posts or links - which would then make Google take away any Rank I might have. Just Because. Yep, I definitely understand this PageRank thing. How about you?